She claims revisionists are just as unbending as the other side. She says near the end that writers like Richard Tedor and others who claim that HItler invaded Poland because of the Bromberg massacre are making mistakes because Hitler invaded on September 1 while the Bromberg massacre occured on the 3rd. She obviously missed this part from jrbooksonline. She also needs to look at this English translation from olodogma. The deportation and expulsion and the mass murder of the ethnic Germans before and at the beginning of the war in Poland was by no means confined to the "Bloody Sunday of Bromberg", which is only too often downplayed or even denied outright today. In this book the reader experiences almost first-hand the terrible fate of tens of thousands of ethnic Germans in Poland at the outbreak of the war in 1939. This English translation, published here for the first time in 2004, commemorates the 65th anniversary of these events that are an eternal stain on the family bibles of all subsequent Polish generations! Are we starting to get it now? That this had been going on before Hitler invaded on September 1st? She's got a point, if someone isolates the Bromberg massacre as a reason. But it wasn't the only atrocity of it's kind. The numbers of German refugees from Polish controlled territories grew into the ten thousands in the weeks and month before the 1. September 1939. I guess there was a reason for that. I know of no Revisionists who say that Hitler invaded Poland on 9/1/39 because of the acts by Poles on 9/3/39 at Bromberg. 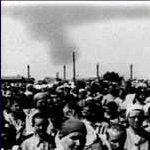 However, the violent acts by Poles prior to 9/1/39 are well documented, see this forum. Just another false strawman argument made by those who cannot debate Revisionists on a level playing field. Then one has to wonder why she is claiming some revisionists argue that way. Werd wrote: She says near the end that writers like Richard Tedor and others who claim that HItler invaded Poland because of the Bromberg massacre are making mistakes because Hitler invaded on September 1 while the Bromberg massacre occured on the 3rd. She obviously missed this part from jrbooksonline. Her video I mentioned earlier has been taken down. I wonder why. She has a reply. "Note name removed is one of the only people in the movement to still associate with Veronica Clark and provide a forum for her race-mixing agenda. If name removed is for real, he shouldn't be surprised of offended that people would question his genuisness." So the white nationalist cult thinks that National Socialist race theory itself is a "race-mixing agenda"? That's rich. Not to mention I only did two radio shows with the gentleman whom "Mack the Knife" here is trashing, so this is hardly indicative of some covert "agenda" regarding "promotion of race-mixing." Mac is a clown on top of being a troll. And he's not even a good one. I could shred him further but I'll go easy on his this first time around. Little "Mac" claims I have an "anti-revisionist agenda" when in fact I am a neorevisionist. I have made a clean break from trad-revisionism since it overlooks glaring problems for the sake of painting Hitler and NS Germany as wholly benevolent and utterly viceless. Here are two videos claiming that Poland caused Hitler to invade by "slaughtering 58,000 Germans." This figure is not only disputed by National Socialists themselves (Berndt, Kordt & Hesse for example), but what happened to A.I. Berndt's figure of 300,000 as told to Hitler? Why was that figure discarded since that was the figure Hitler was told and had accepted? The true figure is about 5,000 not 58,000. And why is it that the one video shows images of the Bromberg Massacre, which took place on 3 September (after the invasion)? Revisionists are confounding two seperate anti-German actions in this case. And, lest we forget, Hitler and the High Command were making invasion plans long before either of these massacres took place. Hitler did not cite the 'slaughter of Germans' as his casus belli behind closed doors; only publicly did he cite this as his reason. Once again, ladies and gentlemen, it takes two to tango. As for my having "dropped the ball": only if you believe CODOH poster Drew Werd who thinks he knows what I wrote in my 1,000 page book The Gleiwitz Incident without actually having read the book. Drew told me via email that he does not buy anything online. And he has never read a single one of my books which are only available via online outlets. If Drew knew his history, he would know that the German death figure of about 5,000 blew up into 58,000, and then 300,000 by the time Hitler heard about it. Drew also fails to understand that actual conference minutes of Hitler and his generals confirms the thesis that Hitler was willing to use force against Poland as early as March 1939 (five months' prior to the actual invasion in August). She just proves my point again. She accuses revisionists of mixing up two seperate events. And why is it that the one video shows images of the Bromberg Massacre, which took place on 3 September ([i]after the invasion)? [/i] Here is the video. Now where have I seen these pictures before? Oh yeah. Right here. 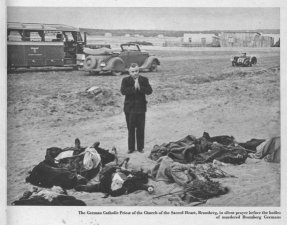 The deportation and expulsion and the mass murder of the ethnic Germans before and at the beginning of the war in Poland was by no means confined to the "Bloody Sunday of Bromberg", which is only too often downplayed or even denied outright today. So even though Veronica Clark is correct to warn revisionists not to blame the September 3 (on onwards) attacks on Germans for the German invasion of Poland which actually occured on September 1, a full two days BEFORE these massacres began, she also seems to have completely ignored what I quoted about how the attacks on Germans were going on LONG BEFORE September at all - even April. At least she did in her response to me. Maybe she covers it in her book. Let me also remind people how Udo Walendy and Gerd Schultze-Rhonhofalso proved that Germany wanted to invade Poland but called it off more than once. Here is a summary of Gerd's book THE WAR THAT HAD MANY FATHERS that someone sent me via PM on another board. So I finished the War that had Many Fathers. I think the highlight of the book was at the end where he lists in detail every correspondence on record between the German, British, and Polish governments in the couple of weeks leading up to the 9/1/39 attack on Poland. Hitler actually canceled the attack order 3 times in order to give more time to negotiate with Poland. But he kept coming to a roadblock. The British government kept telling the Germans that they needed to negotiate the return of Danzig and the protection of German minorities directly with the Poles. Meanwhile the British were telling Poland that they should not negotiate with Germany and that they should dig in their heels because if there was a war Britain and France would have their back. So when Germany kept trying to negotiate with Poland, Poland would never agree to direct negotiations and would delay. This happened over a period of 2 weeks. During this time there was a crisis in which there were about 80,000 German refugees from Poland, the German (and Ukrainian and Jewish) minorities in Poland were being discriminated against and kicked out of their jobs, there were several border skirmishes between Polisha and German troops, and the Polish military fired anti-aircraft battery's at German commercial aircraft at least 3 times! Hitler's generals told him that the absolute latest date that he could attack Poland was September 1st, because they might get bogged down due to weather if they attacked later than that. So Hitler delayed as long as he could and then gave the attack order. My conclusion, after reading all that, is that Hitler was really trying to diplomatically resolve this crisis, but the British wouldn't let him do so, because they were sick of Germany growing stronger without having to spill blood. People should also check this section of Udo Walendy out particularly. Apparently, she deleted this one site of hers. And she had severely redacted the presence of many articles on this site. And I have gone back over posts of mine at codoh and rodoh that are links to youtube videos of hers and many of them have been deleted. I wonder if she has totally taken down her youtube channel now, if not severely redacted it's upload content? She has done this before. When I type in her name on youtube, I can't even get any of her videos, nor does her channel come up. Just videos others have made about her. Oh well. I guess she is taking a break, whatever that means. Bet on that the wordpress blog has been removed after complaints. I find that to be a peculiar coincidence as she apparently deleted her YouTube channel today, along with other content/sites, some of which Werd listed above. Hektor wrote: Bet on that the wordpress blog has been removed after complaints. An interesting discussion on Stormfront has some posters claiming there is not even any credible testimonial evidence that Germans were being slaughtered by Poles at any time before September 3 1939. Someone correctly says on page 17. If there are some other atrocities on some other dates, then the burden of proof is on people to provide specific description of what (allegedly) happened, the date and evidence/sources. Otherwise it's nothing but trolling & spamming and will be dealt with accordingly. Veronica K. Clark: Officially retiring from Third Reich/NS history. The past 6 years of publishing have been wonderful and enlightening and I thank all those who have been very kind and supportive over the years. But it's time for me to move on to different subject matter and topics. I will still be doing my secheduled radio interview, but it will be the last on this subject. Now, I had some things to say about her attack on revisionists and their interpretation about Bloomberg massacre. On the internet, she not only has caught flack from revisionists because of her apparent hatred of white men that they misread as her anger at white male hypocrits who for exmaple would expose how women are treated in Islam, but then would themselves also beat their women. Hence, self styled Men's Rights Activists have flooded her youtube pages with vicious comments and also purposely put up a bunch of one star reviews of her amazon books when they didn't even read the books. Why do I point this out? To focus on another statistic that revisionists, or rather neo-revisionists as she styles herself, still get harrassed for even daring to expose certain holocaust myths to even a marginal extent. Hannover wrote: I know of no Revisionists who say that Hitler invaded Poland on 9/1/39 because of the acts by Poles on 9/3/39 at Bromberg. Hannover I read you all the time and I do not know who you are really- likely someone I already know in the course of my awakening. You make it prominently always in the "liars" forum. Your knowledge is totally encyclopedic and it seems it extends into the rest of the lies as well re: ww2 not just holocaust related. I am to say the least very impressed- and also very thankful! On the subject that you just spoke of here- where you claimed that violent acts prior to Sep 1st are well documented.. I am not in the slightest doubt because of circumstantial evidence I know about (such as Hitler's letter to Daladier etc- you would have to take that as "black propaganda from Hitler" in order to believe that it did not occur and many other official non-nazi, non-German recognitions of it as fact). I meant the establishments forums (you know what they are). I will take a look after xmas. Thanks to you and Mortimer... And merry Christmas to both!! This is why I asked Hannover because when there's a case he systematically pulverises it. Am about to check out his linked thread next..